Remote controlled cars are fun, sure, but self-driving robotic cars are even more fun. In this tutorial, we’ll build a four-wheeled robot that can drive around and avoid obstacles. I purchased this complete 4WD kit from AliExpress, but you could easily buy most of these components from an electronics store and put it together yourself. I recommend reading through all of the instructions before you start, as that will make some things clear that might be confusing on the first time through. Also, this may look like a very long, advanced project due to the length of the instructions, but it’s actually pretty simple. No need to be intimidated – this is a beginner level project that you can get some satisfying results with, then build upon as you learn more. Don’t like this style of robot? 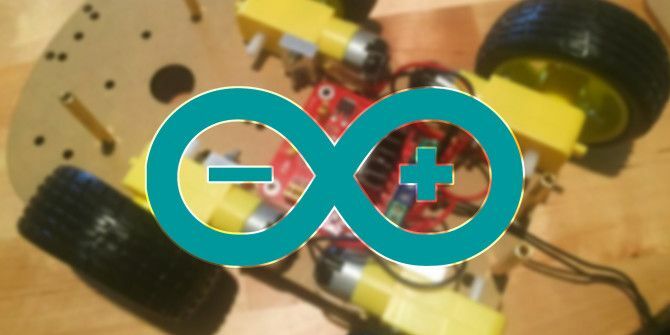 Here’s some more Arduino robots 8 Arduino Robots You Can Build for Less than $125 8 Arduino Robots You Can Build for Less than $125 The Arduino can do a lot, but did you know it can create full-fledged robots? For quite cheap, too! Read More you could easily build instead. To get started, we’ll attach the motors and the H bridge (the card that delivers power to the motors) to the lower part of the chassis. First, attach the four metal brackets (they’re rectangular, drilled blocks of metal) to each motor using two long bolts and two nuts. You’ll need to make sure that they’re attached correctly, so check out the image below to make sure that the side of the block with two drilled holes will face downward. Note that the wires on each motor are pointing toward the center of the chassis. Now that the H bridge has been attached, you can start wiring up the power supply. Because the six-AA battery holder comes with a DC adapter, you’ll need to either cut off the end (which I did) or run jumper wires to the batteries themselves. I found that I had to strip some of the housing off of the motor wires to get this to work. Now that you have the motors and the power supply all wired up, slide the wheels onto the motor drive shafts, and attach the four copper shafts in the locations show in the picture below (each copper shaft needs one small bolt). This robot is starting to take shape! Now, set that part of the chassis aside and grab the other one which will sit on top. The next step is to attach the Arduino—again, I had to use electrical tape, but you should be able to better secure yours with some bolts and nuts. Then flip the servo upside down into the black plastic ring of the holder. Make sure that the wires coming out of the servo are facing in the same direction as the longer part of the holder (again, see the image below), and use four tiny screws to secure the crossbar (there are four holes in the holder that align with the holes on the crossbar). Finally, take the other two pieces of the servo holder and snap them onto the servo (there are grooves in the side pieces that match the plastic tab on the servo). Now that the servo holder is complete, it can be mounted to the chassis. It’s time to give our robot some eyes. Attach the ultrasonic sensor to the servo holder using two zip ties. If you’re working from the same kit as I am, you’ll have received an Arduino sensor shield. We won’t be using it in this build, but you can pop it on top of the UNO now if you want (as I have in the image below). Just align the pins on the bottom of the shield with the I/O ports on the Arduino and press down to connect them. You don’t need it at the moment, but shields can come in handy The Top 4 Arduino Shields To Superpower Your Projects The Top 4 Arduino Shields To Superpower Your Projects You’ve bought an Arduino starter kit, you’ve followed all the basic guides, but now you’ve hit a stumbling block - you need more bits and bobs to realise your electronics dream. Luckily, if you have... Read More . 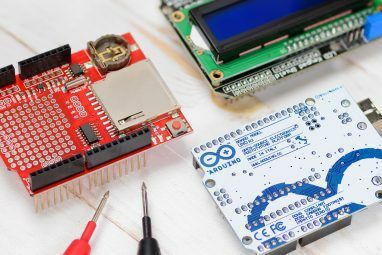 Whether you connect a sensor shield or not, you’ll now need four wires to connect the ultrasonic sensor to the Arduino. There are four pins on the sensor, VCC, GND, TRIG, and ECHO. Connect VCC to the 5V pin on the Arduino, GND to GND, and TRIG and ECHO to I/O pins 12 and 13. Now grab the lower part of the chassis, and connect six jumper wires to the I/O pins of the H bridge (they’re marked ENA, IN1, IN2, IN3, IN4, and ENB). Take note of which color wires are connected to which ports, as you’ll need to know later. Now, use four short screws to attach the upper part of the chassis to the copper shafts. Set the six-AA battery holder on top of the chassis (screw it down if you can), attach the 9V cell holder to the Arduino, and this bot is ready to rock! Well, almost ready to rock. It doesn’t have quite enough personality yet. There we go. Now to give it a brain. Let’s do some programming. That’s a lot of code for a simple test, but defining all of those functions makes it easier to tweak later. (Big thanks to Billwaa for his blog post on using the H-bridge for defining these functions.) If something went wrong, check all of your connections and that the wires are connected to the correct pins. If everything worked, it’s time to move onto the sensor test. To use the ultrasonic sensor, you’ll want to download the NewPing library, and then use Sketch > Include Library > Add .ZIP Library… to load the library. Upload the sketch, and open up the serial monitor using Tools > Serial Monitor. You should see a rapidly updating sequence of numbers. Hold your hand in front of the sensor and see if that number changes. Move your hand in and out, and you should get a measurement of how far away your hand is from the sensor. If everything worked correctly, it’s time to put it all together and let this thing run! Here’s the code for the robot now. As you can probably tell, this is basically the two test sketches put together with an added if statement to control the robot’s behavior. We’ve given it a very simple obstacle-avoidance behavior: if it detects something less than four inches away, it will backup, turn left, and start moving again. Here’s a video of the bot in action. Once you’ve gotten this behavior working correctly, you can add more complex behavior; make the robot alternate between turning left and right, or choose randomly; sound a buzzer if it gets close to something; just turn, instead of backing up; you’re really only limited by your imagination. You could use just about anything in your Arduino starter kit What's in Your Arduino Starter Kit? [Arduino Beginners] What's in Your Arduino Starter Kit? [Arduino Beginners] Faced with a box full of electronic components, it's easy to be overwhelmed. Here's a guide to exactly what you'll find in your kit. Read More to add more functionality. You’ll notice also that we haven’t coded anything for the servo yet: you can actually makes your robot’s “eyes” move back and forth. perhaps using them to seek out a path instead of just backing up whenever it finds an obstacle directly in front. Let us know if you decide to build this robot or another one, and tell us how you decide to customize its behavior or looks. If you have any questions about this robot, post them in the comments below, and I’ll see if I can help! Explore more about: Arduino, Robotics. Arduino Programming for Beginners: Traffic Light Controller Project TutorialArduino Buying Guide: Which Board Should You Get? my friend can you send me a picture of the construction instructions? Hello, thank´s for all but... the servo?? the remote control??? the IR sensor??? your project is missing many things. Under what pins have you connected the servo motor? The link to Ali Express is down, could you write the reference of the kit please ? Where can i find the A1 and A2 do you mean IN1 IN2 etc? Actually 9V is not enough for operating motor control sheild. what should i do ? Really? I ran it with a 9V and I didn't have any problems. Is it a different motor shield, do you know? You could hook up a larger battery, but I have no idea what effect that might have on any of the other parts of your robot. Can you send a full code with ir sensor? Sorry, I'm not sure how to answer this question. It's been a long time since I built and coded this thing, and I don't remember anything about using a header file with the newping library. Did you copy the entire code from above and add it in the correct location? Let us know what you find, too! Please remember that there is no word "alot." It is a lot. A is one word and lot is another. stfu, it's a robotics tutorial. I haven't done either of those, but I'm sure you can find something on Instructables or a similar site. If you do, feel free to share in the comments here so we can check them out! First of all, thank you for sharing the lesson. I am teaching my 6 students using the kit from AliExpress as you recommended. It is disappointing that it is talking so long to ship, yet when it is arrived, it is missing part! Quality of AliExpress site and China vendors still need alot of improvement in the quality and QA. Yeah, you're always taking a bit of a risk ordering from AliExpress. It's tough to beat it on price, but there's a tradeoff there, too. This would be a great kit for students, though! I'm glad you found the article useful. hey dann, great project. I did it and almost have it done, but I can implement the header file, when i add the library, where am I suppose to copy your hearder code in my newping library thanks. thank you so much. please make video about this. 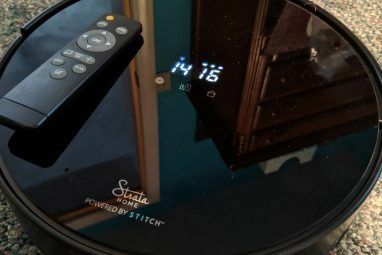 Monoprice Strata Home: The Best Budget Robot Vacuum?